Citation Information: JCI Insight. 2018;3(4):e96006. https://doi.org/10.1172/jci.insight.96006. Heart failure with preserved ejection fraction (HFpEF) can arise from cardiac and vascular remodeling processes following long-lasting hypertension. Efficacy of common HF therapeutics is unsatisfactory in HFpEF. Evidence suggests that stimulators of the nitric oxide–sensitive soluble guanylyl cyclase (NOsGC) could be of use here. We aimed to characterize the complex cardiovascular effects of NOsGC stimulation using NO-independent stimulator BAY 41-8543 in a double-transgenic rat (dTGR) model of HFpEF. We show a drastically improved survival rate of treated dTGR. We observed less cardiac fibrosis, macrophage infiltration, and gap junction remodeling in treated dTGR. Microarray analysis revealed that treatment of dTGR corrected the dysregulateion of cardiac genes associated with fibrosis, inflammation, apoptosis, oxidative stress, and ion channel function toward an expression profile similar to healthy controls. Treatment reduced systemic blood pressure levels and improved endothelium-dependent vasorelaxation of resistance vessels. Further comprehensive in vivo phenotyping showed an improved diastolic cardiac function, improved hemodynamics, and less susceptibility to ventricular arrhythmias. 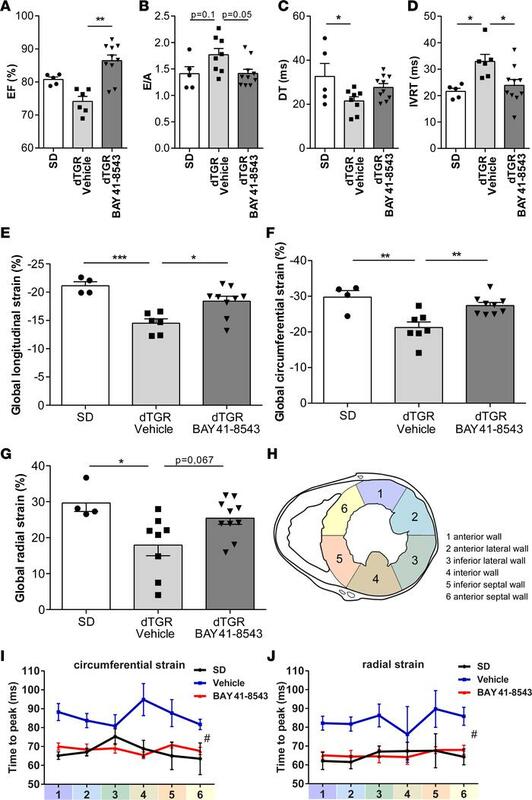 Short-term BAY 41-8543 application in isolated untreated transgenic hearts with structural remodeling significantly reduced the occurrence of ventricular arrhythmias, suggesting a direct nongenomic role of NOsGC stimulation on excitation. Thus, NOsGC stimulation was highly effective in improving several HFpEF facets in this animal model, underscoring its potential value for patients. Stimulation of NOsGC improves diastolic function and regional diastolic compliance. (A) Ejection fraction (EF) values of the left ventricle were preserved in vehicle-treated dTGR. BAY 41-8543 administration led to a significant increase in EF (**P < 0.01; 1-way ANOVA with Dunn’s post hoc test; data expressed as mean ± SEM; SD, n = 5; vehicle, n = 6; BAY 41-8543, n = 10). (B) Ratio of peak E velocity to peak A velocity (E/A) was slightly but not significantly increased in vehicle-treated dTGRs (P = 0.1).The E/A ratio was reduced by BAY 41-8543 treatment (P = 0.05; 1-way ANOVA with Tukey’s post hoc test; data expressed as mean ± SEM; SD, n = 5; vehicle, n = 8; BAY 41-8543, n = 10). (C) Mitral valve E-wave deceleration time (DTT) was shortened in vehicle-treated dTGR (*P < 0.05; 1-way ANOVA with Tukey’s post hoc test; data expressed as mean ± SEM; SD, n = 5; vehicle, n = 8; BAY 41-8543, n = 10). (D) Isovolumetric relaxation time (IVRT) was prolonged in vehicle-treated dTGRs. Administration of BAY 41-8543 diminished the IVRT (*P < 0.05; 1-way ANOVA with Tukey’s post hoc test; data expressed as mean ± SEM; SD, n = 5; vehicle, n = 6; BAY 41-8543, n = 10). (E) Global longitudinal strain (GLS) was reduced in vehicle-treated dTGR. BAY 41-8543 treatment led to an increase in GLS (*P < 0.05; ***P < 0.001; 1-way ANOVA with Tukey’s post hoc test; data expressed as mean ± SEM; SD, n = 4; vehicle, n = 6; BAY 41-8543, n = 9). (F) Global circumferential strain (GCS) was decreased in vehicle-treated dTGR. BAY 41-8543 treatment led to an increase in GCS (**P < 0.01; 1-way ANOVA with Tukey’s post hoc test; data expressed as mean ± SEM; SD, n = 4; vehicle, n = 7; BAY 41-8543, n = 9). (G) Global radial strain (GRS) was lower in vehicle-treated dTGR. BAY 41-8543 treatment led to an increase in GRS compared with vehicle but did not reach (P = 0.07) significance (*P < 0.05; 1-way ANOVA with Tukey’s post hoc test; data expressed as mean ± SEM, SD, n = 4; vehicle, n = 8; BAY 41-8543, n = 10). (H) For assessment of regional myocardial strain in the parasternal short axis, the left ventricle was divided into 6 segments. (I) Time-to-peak circumferential strain is elevated in vehicle-treated dTGR. BAY 41-8543 administration led to a shorter time-to-peak strain in circumferential axis (#P < 0.5; 2-way ANOVA; data expressed as mean ± SEM; SD, n = 4; vehicle, n = 6; BAY 41-8543, n = 10). (J) Time-to-peak radial strain was elevated in vehicle-treated dTGR. BAY 41-8543 administration led to a shorter time-to-peak strain in radial axis (#P < 0.5; 2-way ANOVA; data expressed as mean ± SEM; SD, n = 4; vehicle, n = 6; BAY 41-8543, n = 10).